I prefer historical miniatures over fantasy and sci-fi, but I have a very soft spot for Game Workshop's 40K Imperial Guard. I've been buying the little guys for over twenty years and have hordes of them. I am posting pictures to show the evolution of Guard weaponry. You'll quickly see the technology is decreasing as the weapons are getting bigger, but you'll also notice the factories are making at least a better looking product. First is heavy bolter. I have found eight versions of this weapon. 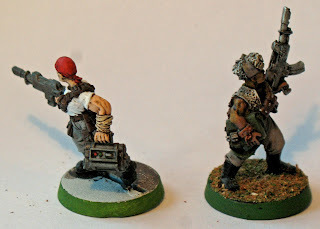 Left to right: 1. this ancient little heavy bolter dates back from the days of the Imperial Army; 2. a metal heavy bolter, anti-grav technology allows a regular human to carry these large weapons; 3. slightly different plastic version; 4. an early Cadian heavy bolter, the grav technology is lost and now they have to have wheels to move these beasts; 5. Unless you're strong as a marine like this Last Chancer; 6. the new Cadian plastic, I don't know how two guys are supposed to carry it around; 7. a newer Vostroyan one with drummed ammo; 8. a tarantula with really large heavy bolters, I think they really belong on servitors. Autocannons are not as common throughout the ages and I only have two pictures for you: 1. old metal Cadian; 2. new plastic Cadian. Only two regular mortars and a mole mortar here. 1. metal; 2. newer plastic; 3. lost technology from a silly weapon called the mole mortar manned by plastic squats. The round would travel underground to the target. I glued a regular mortar to one of them so I could called it a "counts as" mortar. Missile launchers. 1. 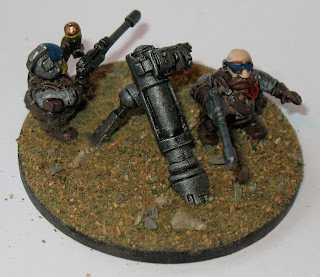 Plastic launcher stolen from a plastic beakie marine; 2. actually a GW Rogue Trooper; 3. I'm only pretty sure this is a GW launcher; 4. Catachan with lighter launcher and stand; 5. Mordian version without face plate and stand; 6. Steel Legion version that looks more like what all these weapons really are, rocket grenades or just plain rockets; 7. plastic Cadian. Flamers. 1. ancient model titled "ex-tech" whatever that means; 2. a beakie with flamer (none of my Guard with stolen weapons are painted); 3. 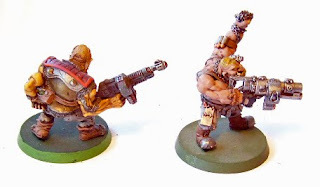 Mordian; 4. plastic Catachan; 5. 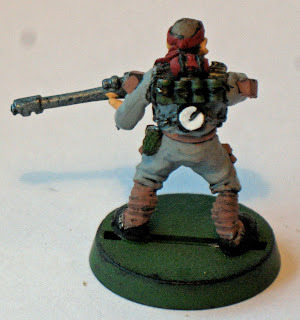 Cadian plastic; 6. Vostroyan version. Grenade launchers. 1. Really big Imperial Army version; 2. smaller RT version; 3. 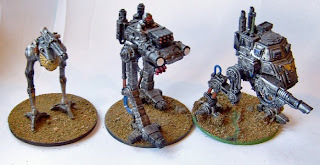 Mordian; 4. stubby little Steel Legion version; 5. plastic Cadian. Lascannons. 1. Original metal; 2. original plastic; 3. a different (horribly painted) plastic on a tarantula; 4. metal Cadian; 5. metal Steel Legion; 6. longer plastic Cadian with converted wiring system. Long lost Human Bomb. Politically incorrect suicide bombers of the Emperor. Heavy Stubber and Hunter Killer. GW never made us proper man portable versions of these weapons, so I made my own. 1. Actually a Renegade Miniatures WW1 Vickers machine gun with IG bits; 2. Hunter-killer simply planted on a heavy weapons tripod.